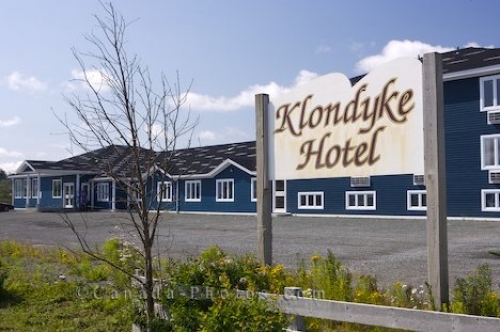 The sign along the Baccalieu Trail in the town of Bay Roberts in Newfoundland, Canada advertises for the Klondyke Hotel. The hotel was first opened in 2003 with an extension added in 2006. There are a total of 25 rooms in the hotel with a conference room which is used for meetings and banquets with a capacity of about 100 people. The lounge in the hotel has a beautiful view of the harbour. The Klondyke Hotel is centrally located in the town where guests can walk to the banks, supermarkets, restaurants, parks, shops and the tourist attractions. Klondyke Hotel in the town of Bay Roberts, Highway 70, Baccalieu Trail, Conception Bay, Avalon Peninsula, Newfoundland, Newfoundland Labrador, Canada. Picture of the sign outside the Klondyke Hotel in the town of Bay Roberts in Newfoundland, Canada.